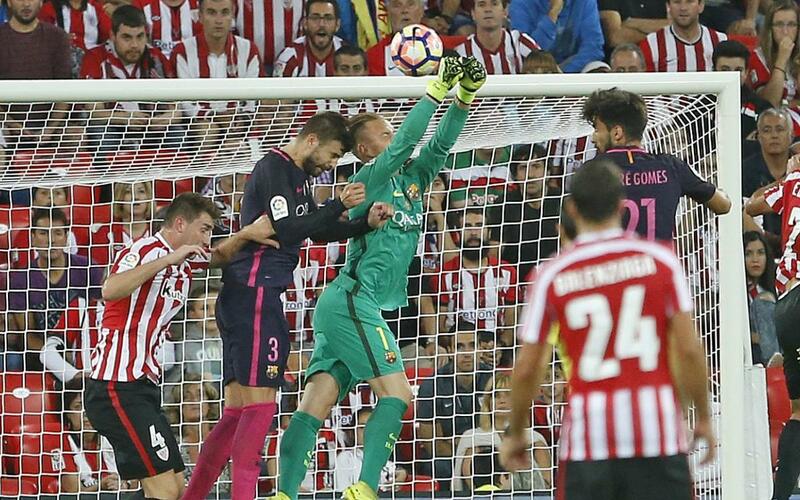 Barça goalkeeper Marc-André Ter Stegen broke the record both for completed passes and for passing attempts by a goalkeeper in a league game with 51 out of 62. ClaudioBravo set the previous record for completed passes by a goalkeeper with 44 last season, also against Athletic Club at San Mamés. LuisEnrique notched his 100th victory as the Barça manager. And he did it in just 126 games. Overall, he has 61 wins in La Liga, 18 in the Champions League, 18 in the Copa del Rey, 1 in the UEFA Super Cup, 2 in the Spanish Super Cup, and 2 in the FIFA Club World Cup. LeoMessi made his 350th appearance in La Liga. Of those games, he has won 315, and has scored a jaw-dropping 314 goals. ArdaTuran got the assist on Ivan Rakitic's first-half goal, giving him three assists to go along with one goal in La Liga this season. With Sunday's goal, Barça are averaging 4.4 goals per game in their last seven in La Liga, including this season's first two and last season's final five matches — all of them wins. Defenders GerardPiqué and SamuelUmtiti led all field players in completed passes with 65 and a 90% success rate. SergiRoberto played all 90 minutes at right full-back and turned in an outstanding performance, completing all of his crosses into the Athletic penalty area.